Carrie Hui tells the story of her Peanut Butter far better than I ever could. Take it away, Carrie! “Looking at those fluffy cotton-candies bopping up and down the park, I was completely smitten. No, make that head over heels madly in love with these adorable yet weird in length, creatures with those oh-so-short legs and AMAZING butts! 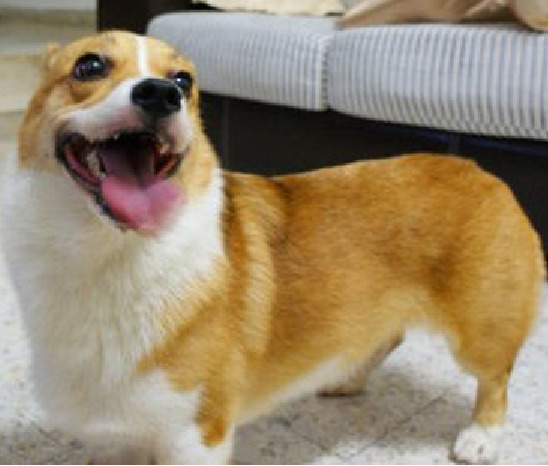 As much as I wished they were called Cotton Candination or Flufferzer, I later found out that they are known by the breed name of Pembroke Welsh Corgi, or Corgi for short. 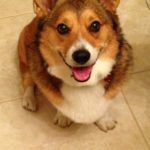 Coming from the part of Asia where Poodles and Schnauzers dominate most homes, it wasn’t easy for me to find owners who have Corgis, much less authentic Corgi breeder! It took me a year of searching high and low before I found her, my very first furkid — Peanut Butter. Having zilch experience as a furkid owner, she is nothing like what I had always imagined — a gentle and sweet dog. 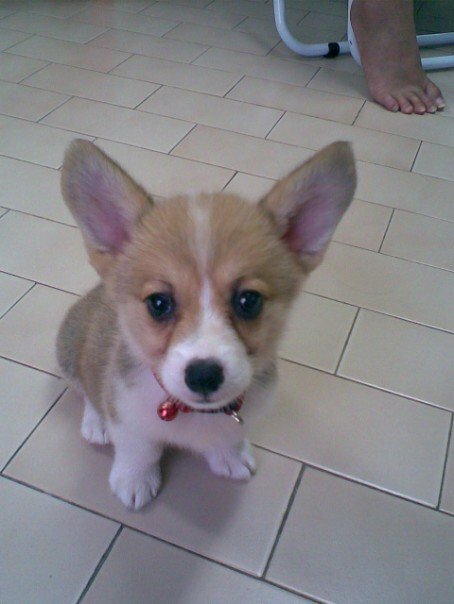 In fact, during those early days, there were times I found myself close to tears and doubting whether I was good enough to be a furkid owner. Peanut Butter’s stubbornness was definitely hard to cope with. Almost like having a mind of her own, she will only do the things in line with her liking or objective. 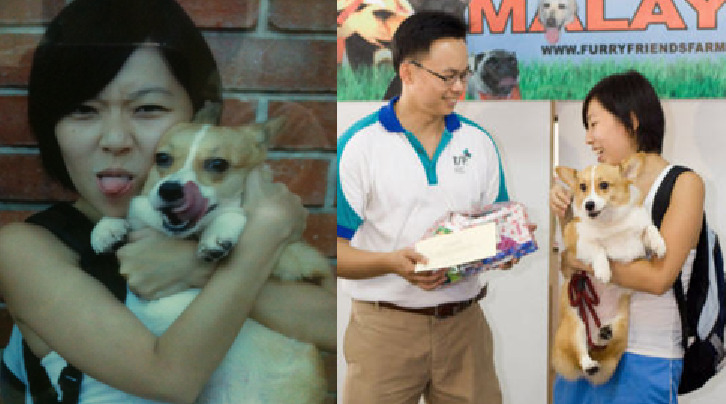 She is definitely intelligent, having graduated as one of the top scorers in her basic obedience class. At times she cunningly pretends she forgot the commands or simply didn’t know what I was trying to tell her. Just pull out her favorite treats, however, and Wohla! She will perform all the tricks and commands to perfection. 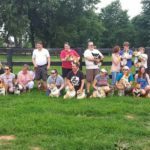 Basic obedience training – notice how I need to bend my body to reach the stubby dog? Peanut Butter’s daily activities begin with frapping at the ungodly hour of 8 in the morning even on the weekends … sometimes at 7, depending on how far she decides to drive me up the wall that day. After a few laps of frenzied frapping and breakfast, her daily routine usually involves perfecting the art of sleeping, fur-ing up and drooling on my double size bed before settling down on a comfortable spot for the rest of the day to wait for me to come home from work. After a while, I realized that this is probably her way of showing me how much she loves me (chuckles). 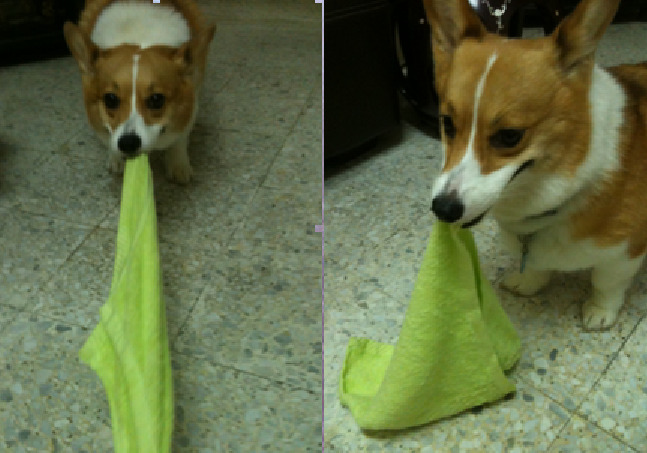 Evenings are the time for her favorite games: tug of war. Hankies, turkey, squeaky chicken, half-torn bunnies, you name it. She is spoiled rotten with a box full of toys! Peanut butter’s favorite game — tug of war. 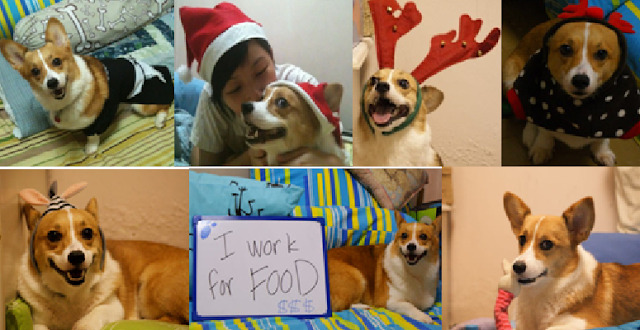 Besides spending time with us humans, she delegates the rest of her time falling in love with handsome Corgi Niji Momiji, as well as smooching with her long time first love – Alfie the JRT. Tongues altogether now! We look alike, eh? We participated at Pet’s Dine-Out Day, an event which allows dogs and owners to have a splashing time at the pool. There we are in the garden back at home enjoying the kiddie pool on a scorching hot day. Birthday at Cherating Beach: the shortest coast guard on duty! 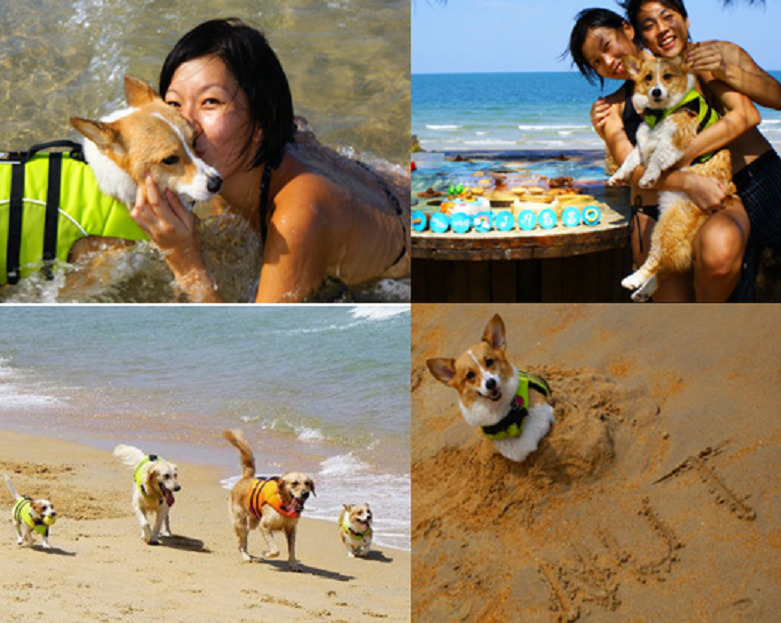 Celebrating her third birthday last year at Cherating beach, the only dog friendly resort we have here. Both the human and furkids had a blast roaming around the beach freely. I have to admit, this is one of the best holidays I’ve had so far. Well, nothing beats a holiday with your loved ones — with or without fur. Cosplay or model wannabe: the many clownish faces of Peanut Butter. 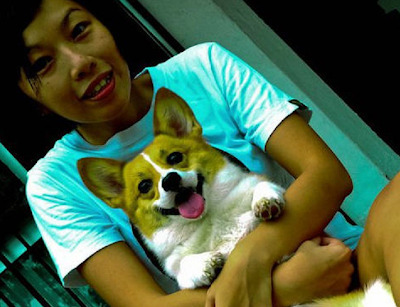 There is this saying that once you have a Corgi, you will never settle for anything less. Though some days she may be absolutely annoying, along the way Peanut Butter has brought joy into my life with her endless rounds of happiness and acts of adorable cheekiness. Welcome to The Daily Corgi, Peanut Butter! You are undeniably awesome-sauce’ um! 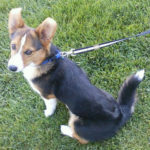 (This post was first published on The Daily Corgi on June 6, 2011). Wednesday Adoptable: Ollie of Idaho! Noodles also LOVES playing tug-of-war. We need to get Peanut Butter and Noodles together. She is so sweet! 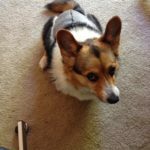 !I agree : I LOVE corgi butts! And when they lay down with their little legs behind them? Priceless.its all priceless. Love c orgis! You look to be an amazing fur mum!! God bless! I love to hear stories of humans discovering they were put on earth to serve the bunny butts. Peanut Butter is adorable!! May you share many years together! !